Most people would agree that when someone mentions the concept of weight training, Arnold Schwarzenegger’s name will always be mentioned. The ripples Arnold has left in the world of weight training is still being felt today. In order to make gains, Arnold used to train every muscle group with unparalleled intensity. Weight training is not simply a case of going to the gym and performing a few routines while talking to your friends. Arnold knew this and realised that training every body part with such intensity is of importance. This is to ensure that every muscle group was taken seriously and worked to the very maximum. Nobody wins seven Olympia titles by sitting on a flat bench and looking in the mirror. Overlooking the basic foundation of weight training adopted by Arnold may not be such a good thing to do for beginners. Instead of chasing girls at the gym, one must chase the pump. The pump is associated with the burning sensation felt during specific exercises or high repetition training. Keeping the mind on the muscle is a key element in promoting muscular development. Experienced weight trainers may echo the term “mind-muscle connection”. They visualise the muscle being trained and feel it working during each rep.
Visualising the performance. This is not a case of sitting at the end of the bed wishing to gain the most amount of muscle ever and not working hard to do so. ‘Visualise success and follow that vision’. Inspirational words from Arnold who often mentally imagined the way he wanted his muscles to look and then pictured the muscles taking this form during his training. Trainers who like to look into every mirror they walk past will like this next point. Striking a pose. This gives one a free pass to pose as much as they like and not feel vein. Those who have had the pleasure of watching ‘Pumping Iron’ have seen Arnold pose throughout the film. People may not have time to pose for several hours, but several minutes is better than nothing. Going heavy has been proven to stimulate muscle growth. Bodybuilders shouldn’t train like power-lifters but they should master a wide variety of techniques. Using heavy weights is important but don’t avoid that sought after pump. Experiment in maximising the contraction of different muscles while still keeping the visual success at the core of weight training. Rest and recovery. Pump, burn and revitalise. Training like a strongman is imperative for weight training but most importantly eating like a strongman is of the upmost relevance. The proper nutrition for weight training is needed to build muscle and recover from a gruelling workout. ‘Your body is like your favourite car, if you fuel it with junk, it will perform like junk’. A terrific statement to bear in mind outside the four walls of the gym. The importance of protein can be defined as the biggest influence in building and maintaining that well achieved muscle mass. Depending whether one is a recreational weight lifter or athletic weight trainer will determine how much protein is needed. Having 1 gram of protein per pound of body-weight per day will seal the package. This will promote muscle building as well as muscle maintenance. All fats are not bad. Yes, there is such a thing as good fats. Healthy unsaturated and saturated fats are important for weight trainers. Athletes who have a higher fat intake have higher testosterone, which means more gains and improved appearance. A general rule of thumb is to aim to get around 30% of daily calories from fat. Struggling to walk up the stairs in old age when people are skipping up the stairs is not amusing for anybody. So, joint recovery is critical. Good sources of healthy monounsaturated fats such as nuts, avocados and olive oil will help reduce this. To perform like a true warrior and be strong set after set, plenty of carbohydrates are needed. This will be stored in the muscle as glycogen. The main fuel source used when training are creatine phosphate and glycogen. Creatine burns out after around 20 seconds, then the glycogen is activated to help lift that precious metal. Slow digesting carbohydrates such as sweet potato and oatmeal are excellent tank fillers. A reasonable guideline for carbohydrate intake is between 2-3 grams per pound of body weight every day. A full breakdown of a nutritional guide for weight trainers can be found here. Popeye certainly had it right with regards to his secret amour of strength when he ate spinach. This boasts minerals that build muscle and antioxidants to help repair the body. Without a suitable diet, your body will not manifest to the true potential that is possible. Following a diet including whole foods, rather than supplements or processed products will maximize the results. 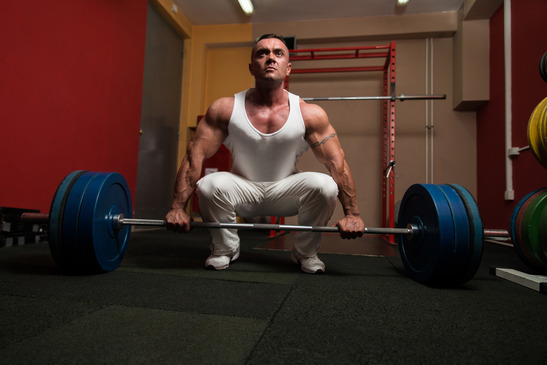 It may be enjoyable or hard to comprehend the necessary structures of lifting weights. Nonetheless, this is ‘The Pain and Gain’ of weight training. Think Like a Body Builder & Train Like a Powerlifter How to Correctly Perform the Barbell Bench Press - And Do You Make These Common Mistakes? Simon Walker is a die hard gym nut, and he loves to share his knowledge online. If only it was as easy to grow muscles as Popeye has it! The eating is the hard bit.